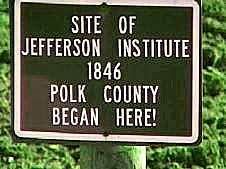 If you were directed from an outside link, be sure to check also in Polk County: 1856 - 1894. The Polk County page was divided because of its size. The Bethel entry in Wikipedia uses this article as a resource. 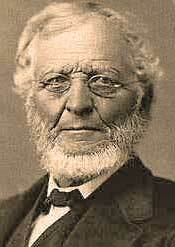 We have noted that Glen Owen Burnett (1809-1886) was among the preachers coming to Oregon in 1846. He settled on a donation land claim of 640 acres of grass and timber east of McCoy in Polk County. Burnett organized the Bethel Church which flourished due largely to his strong, yet reverent and tender appeal and his scathing denunciation of sin. Burnett chose the name "Bethel" because it was the name of the last church he had served in Missouri, a town north of Jefferson City, Missouri on State Route 15. It must have been a pleasant ministry. He gave the name "Bethel Hills" to the heights north and east of Bethel, Oregon. At the time Bethel was founded, the nearest U.S. Post Office was Weston, Missouri. There is a profile on the life of Glen Owen Burnett. In 1855 the first store at Bethel was constructed and a post office was built 10 years later. The town flourished with blacksmith shop, carpenter shop, wagon shop, and a general store. An academy and then a college as built. The story of Bethel College is presented under the Colleges. During the glory days of the college construction in 1855, silver tongued Alexander Vance McCarty was the preacher at the Bethel Church. About 1857 George W. Richardson took that role, keeping it for about 20 years. In 1858, the church reported 80 members. The church probably met in the Bethel College building after it was finished. G. W. Richardson wrote that their meeting place was 36 feet square. The college building was 36 x 44 feet, so we conclude that that main meeting hall was 36 x 36 and the church met there. It was Mrs. Amos Harvey (Jane Ramage) that made provisions for burying the dead. In 1848 she donated two acres at the southwest corner of the family property. The acreage has been increased since and reading the grave markers is like a walk through history. The cemetery is located at the intersection of Zena and Oak Grove, about 2,000 feet south of the Bethel school building. The listing of those buried there is online at our site. The church reported 160 members in 1871, but had declined to 35 members by 1881. J. H. Hawley, C. B. Graves and A. Alderman were the elders while Thomas McBride Morgan was the circuit riding preacher, coming one Sunday each month. The congregation was incorporated with the State of Oregon on May 2, 1889 by E. Bailey, C.B. Graves and F.S. Smith. 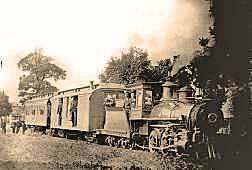 It continued until 1912.
its first run to Dallas, Oregon. The decline of Bethel and its church was partly because of the coming of the railroad. In its earliest days, Bethel was astride of the wagon road that came through Amity and continued south to Monmouth and beyond. But when the narrow gauge railroad was built from Amity to Independence, the tracks went through McCoy, 1.5 miles to the west. This meant moving people and merchandise to McCoy to meet the train. In the photo, note the tiny steam engine. The rails were just 36 inches apart rather than the standard 56� inches. There are profiles on the lives of T. M. Morgan and Amos Harvey. Pioneer Reminder: Bethel Heights, Bethel Hills Road. JEFFERSON INSTITUTE Is located in the Rickreall Valley, one mile west of the residence of Col. N. Ford. The first session of this school will commence on the second Monday of next April and continue twenty-four weeks. Scholars from a distance can be accomodated with boarding in the neighborhood. Terms of tuition, $8.00 per scholar. Link to our map locating the Jefferson Institute sign. The school was in a log cabin on Bowersville Road, west of present-day Rickreall and just north of Rickreall Creek. The site can be located by the marker on the road. The building also served as a church meeting place on Sundays, as well as for holding court. School houses in these pioneer days often served multiple purposes. The school teacher here was Presbyterian, but his wife Ellen Scott Lyle was an active member of a church that was formed later at Rickreall. 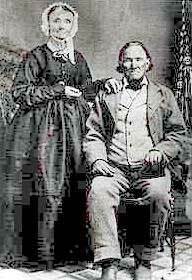 He was a pioneer of 1845 and she came in 1846. The Bible was read each morning at school sessions, each child reading a verse. Dr. James McBride, Mac Waller and Glen Owen Burnett supplied the Sunday preaching for the first winter. Students in that 1845 school session were: Josephine, Caroline, Sarah and Miller Ford; Pauline, Caroline and Marion Goff; Theodore and Amanda Thorp; Thomas V. B., Mary and Marcus Embree; John and Ann Howard; Elmer Wood and Gertrude Applegate. "People came from miles away . . . . Hospitable cabins welcomed the arrivals and happy hours of visiting followed the religious service before the slow moving oxen were turned homeward. In summer additional shelter for the congregation was provided by setting forked tree limbs upright across the front of the building and covering them with fir boughs." Evidently those attending the Jefferson Institute began attending church at Rickreall where they eventually built their own building. Mac Waller considered the church at the Jefferson Institute building to be the first one that he established in Oregon and the Luckimute Church to be the second. It met at the home of Harrison Linville near present-day Parker. The name came from the Luckimute River that enclosed Linville property on three sides. There was a Luckiamute post office with pioneer churchman Harrison Linville as the first postmaster. He ran a ferry service, store, hotel and stagecoach stop as well as serving as an elder in the Luckiamute church. Pioneers at the Luckiamute Church included James O. and Mary Linville Davidson (1847), Edward and Eliza Ann Butler Ground (1853), Harrison and Nancy Bounds Linville (1846) and Isaac and Margaret Butler Smith (1853). On the Luckimute river, the church of which I am a member, brethren Powell, Burnett, Murphey, and others attended, but the winter was so inclement that but little was done. Since then they have held a two or three day meeting with us, and some four persons were added by confession and immersion. We now number some 64 and meet every Lord's day. Christian Record, October 1853, page 124. The third church established by the young Mac Waller was the Lewisville church. It was set amidst the Lewis families at the south edge of Polk County. It is not to be confused with Lewisburg in Benton County. The congregation was launched in 1848, if we accept Waller's claim to have established it, making it among the earliest congregations in Oregon. The building was built during the summer of 1879 with David R. Lewis heading construction work. It is not likely that Mac Waller called these churches together because they were mostly composed of Christians that were close friends and relatives. They were already meeting. He probably aided them in picking leaders and in getting organized. The cause of Christ is slowly advancing in this part of Oregon. On last Lord's day we had two additions by confession and baptism, and I think the prospect good for many more. May the Lord enable us all to honor our profession! The Christian Record has come to me regularly for some four years, and has always been a welcome and interesting visitor. . . .
"By 1871 there were two stores, a post office, a harness shop, a butcher shop, a blacksmith, a shoemaker, and a cooper who made barrels, tubs, kegs and wooden churns." Pioneer members included David R. and Mary Redden Lewis, David William and Susan Lewis, Francis M. and Flora Lewis, John D. and Elizabeth Lewis, James and Elizabeth (Wright) Smith and their son John H. and Martha Jane Lewis Smith. In 1871 the Lewisville congregation reported having 20 members. An 1888 listing of churches shows the church totaling 46 members. Eventually the group dispersed to Monmouth or elsewhere and the church closed. They owned a building, but that has long been removed. The Rickreall church emerged from the group meeting at the Jefferson Institute, several miles to the west. It was started by Glen Owen Burnett on the first Sunday in May of 1848. He was aided by James McBride and Mac Waller in the development of the congregation. Early records suggest the church met at the Ford home for a while. Original members included Nathaniel and Lucinda Ford, his sister and brother-in-law David and Kezziah Goff, Thomas and Polly Bounds and Ellen Scott Lyle, pictured above. Mrs. Lyle was later a member of the nearby Dallas Christian Church. Some of these pioneers are buried in the Burch Pioneer Cemetery. Follow this link to see the listing. The colorful Nathaniel Ford had emigrated from Missouri in 1844 and could have known the McBride family there. Jerry Rushford says Ford worked as a surveyor, school teacher, flatboatman and county sheriff before coming west. He was the first postmaster in Rickreall and the State Legislature elected him as the Oregon Territory Supreme Judge in 1845, but he declined to serve. The Ford's daughter, also named Lucinda, was later married to William Thompson Haley, a graduate of Alexander Campbell's Bethany College. He taught at Bethel and Monmouth. 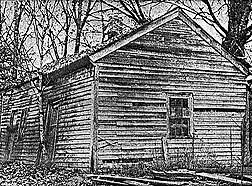 The Polk County Historical Society provided this photo of Nathaniel Ford's early house. The original may have been a log house, with this one built after planed lumber was available. The Fords and the Goffs are buried in the Burch Pioneer Cemetery. Levi Burch was an early preacher in the area before moving to California and the Burch and Ford families were related by marriage. The annual or yearly meetings of the Disciples in Oregon convened at Rickreall (then called Dixie) in 1869. G. W. Richardson mentioned a "shed" that was 80 feet square. This was probably the first building on the present Polk County Fairgrounds. Church planter John M. Harris estimated that 5,000 - 6,000 attended the event. We had no preaching on nights; and it was understood that when night came on, all were expected to retire to bed. We had many preaching brethren present, a few of whom I will name to let their friends know that they have not yet crossed over the Jordan, viz: Dr. James McBride, J. E. Murphey, John A. Powell, John M. Harris, and Old Father Davidson. But many hearts were made sad, and eyes to fill with tears, when we found not our beloved Bro. Callison present. This devoted servant of Christ has been called to his reward since our last meeting. He now "feels and knows what it it to be there." Christian Record, September 1869, page 426. Pioneer Reminders: Burch Street, Burch Grove Lane and Ford Street. This 1855 church was several miles east of the Bethel Cemetery. It was established during an evangelistic meeting held by John Ecles Murphy, Glen Owen Burnett and Dr. James McBride. There were 16 immersed into Christ and 31 others identified themselves as previously immersed. Such a start for a congregation near another active church! There are profiles for Glen Owen Burnett and Dr. James McBride. Amos Harvey reported to the Harbinger that same year as though he were from Spring Valley. He may have assisted in this newer congregation that was also near his home in Plum Valley. There is a profile for Amos Harvey. The Spring Valley post office was moved several times, so the precise location of Spring Valley is difficult to pinpoint today. In 1871 the group reported 28 members. It was apparently in a decline by that year. Orlando Alderman was a Christian Church preacher and prominent land owner at Spring Valley. The Alderman Family Cemetery listing is available on our site.